It has been a while since I last checked in here. My main platform for communication has been via social media, so it was absolutely remiss of me to omit to repeat the same information here. The Midnight Baker remains as a registered business entity although I am currently only baking for a smaller circle due to work commitments. Thank you for all the inquiries sent to my email and my deepest apologies for not being able to reply to each of you in time. “Orange” you glad it is Chap Goh Mei today? I thought it would be nice to commemorate the 15th day of the Chinese New Year with this blogpost that pays homage to the citrus. 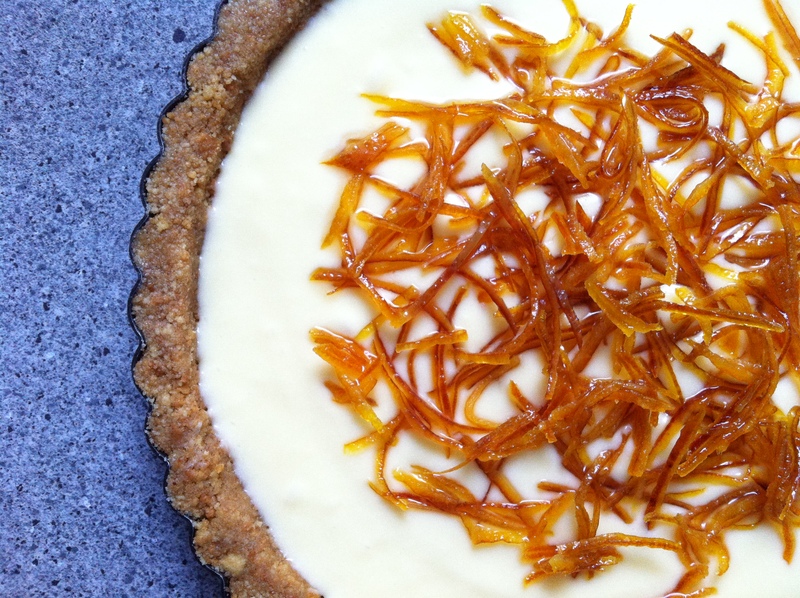 Do you have any favourite citrus recipes? Do share! It goes without saying, I love lemons. Lemons are an unambiguous lot. Sweet. Tart. In your face. You know, kind of like the Bake Slave on a sugar bender. 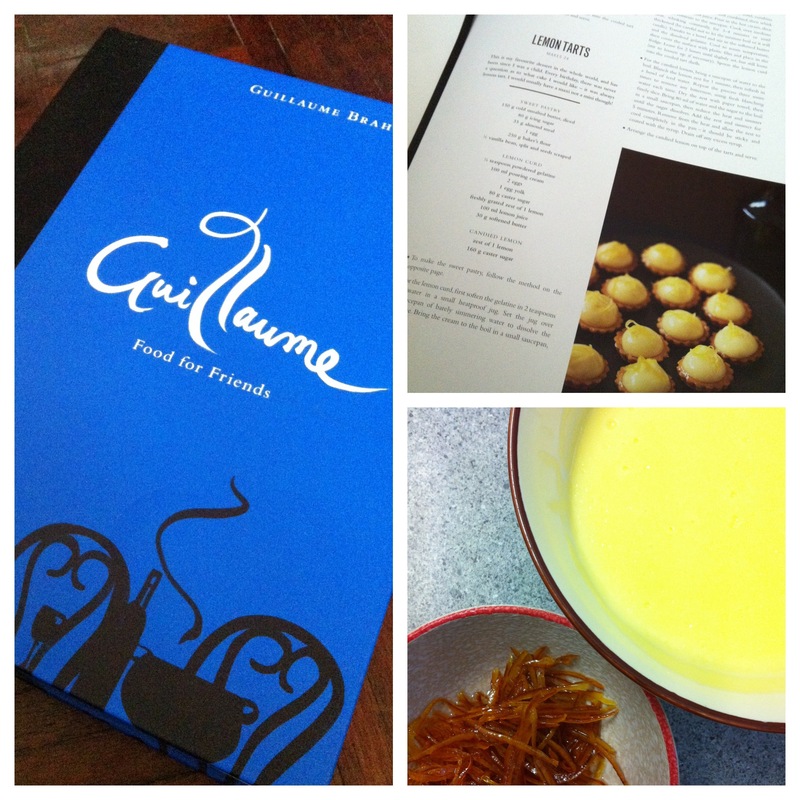 When my childhood buddy gave me a glorious cookbook Guillaume: Food For Friends earlier this year, we poured over it and were floored by the redoubtable Guillaume Brahimi’s famous Lemon Tarts. And so, the seed of a future make/bake was planted that day. Chef Brahimi’s recipe calls for a three parter: a sweet pastry base, lemon curd and candied lemon. Well, I obviously have adherence issues, don’t I? I had blood oranges with Greek style yoghurt earlier this week, and the peels were too pretty for the bin. Waste not, want not. Rustic trans-fat free Cranberry Flaxseed Oat cookies: Price RM 37.50 per tub of 30 hearty pieces. Tropical egg-free Coconut Oat cookies: Price RM 25 per tub of 50 petite pieces. Both types of oat cookies are made with reduced sugar, and with lots of love. Click on the side bar to place your orders before 17th February 2015. 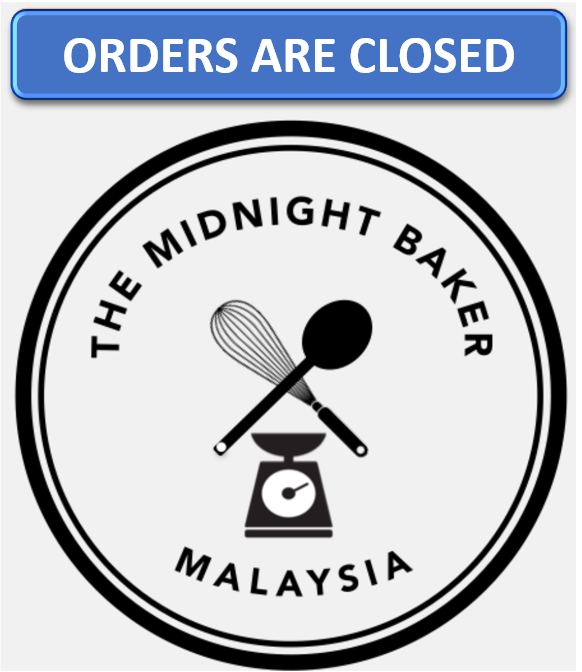 The Midnight Baker® Malaysia: No preservatives. No additives. All good. Thinking of something different for your tea party or pot luck? Something you and your guests can eat in a bite, spare your nails from digging into muffin liners and avoid buttercream moustaches? It is time to make friands, not foes! Friands are moist dense cakes that are made with ground almonds and browned butter. I love pairing fruits with my bakes hence the cherries, which give a nice balance to the friands. The Midnight Baker’s cherry friands are petits fours baked in mini-muffin tins. Though the friands may be small in size, they are big in flavour and are sugar-reduced. Price: RM 37.50 for a box of 15 friands. These are scrumptious reduced-sugar raisin scones. Hands up if you love buttery scones! I am happy to introduce scones to my menu; these are baked fresh on the day of delivery and best eaten warm. 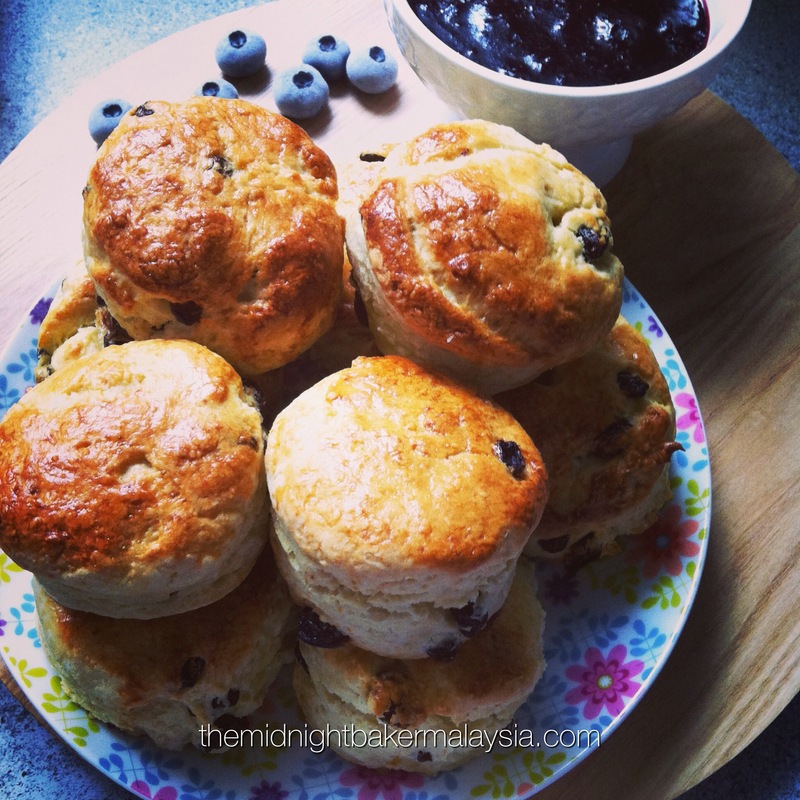 Price: RM 36 for a set of 9 sweet scones. 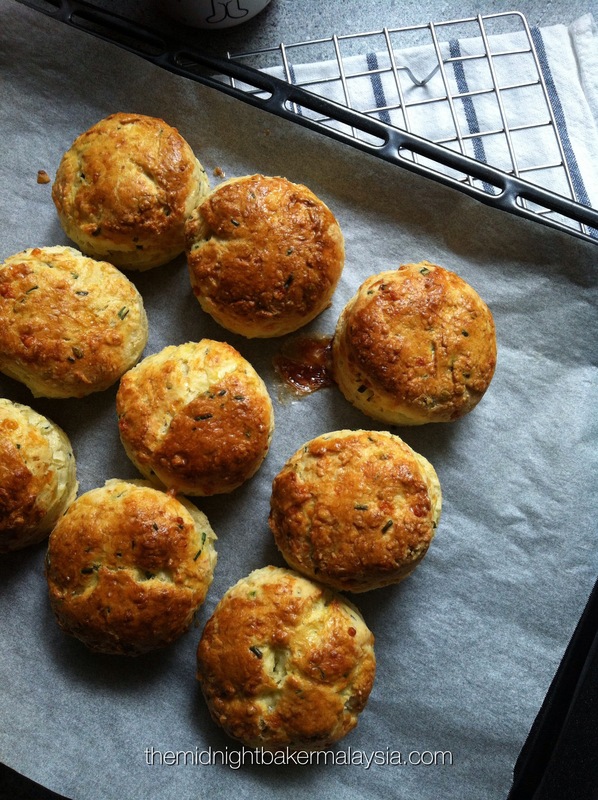 The Chives + Cheddar Scones are made with Maldon sea salt, good quality shredded cheddar and fresh chives. Price: RM 45 for a set of 9 savoury scones. All scones are ± 2.5 inches in diameter and ± 1.5 inches in height. They are made with good quality unsalted butter and full cream milk, and are finished off with an egg wash for glaze. Delicious hazelnut biscotti bites delicately flavoured with fresh orange zest and cinnamon. Hazelnut lovers, do I have the perfect biscotti for you! Based on feedback, some of you prefer having smaller biscotti to dunk into your hot beverages. I hear you! My biscotti are still in 150 g bags but now made into smaller bites for you to savour longer. Hints of fresh citrus from fragrant orange zest and subtle warmth from cinnamon make this hazelnut biscotti a sure winner. 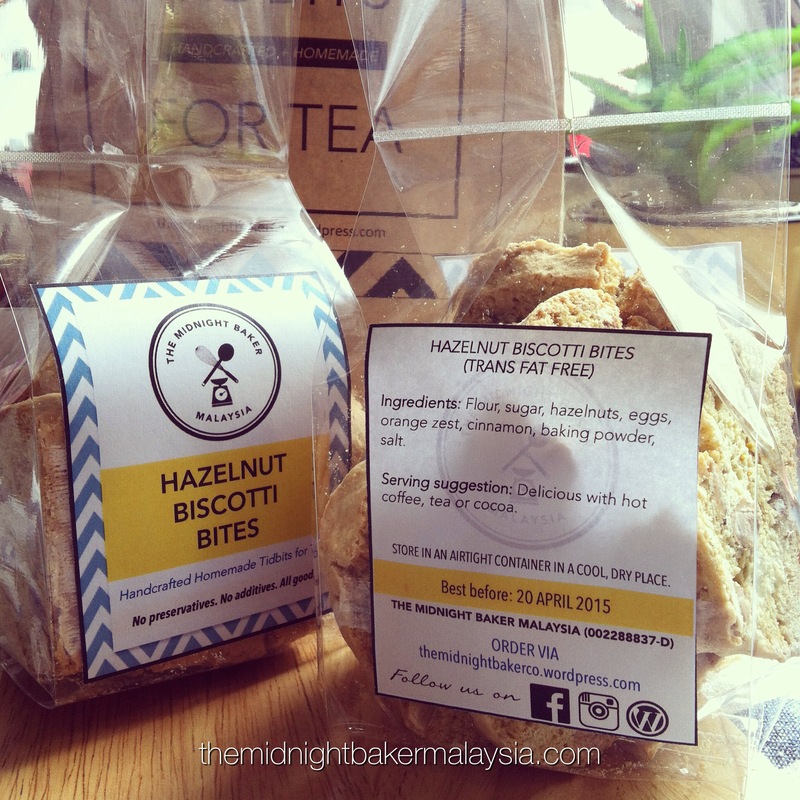 A bag of this delicious Hazelnut Biscotti Bites is RM 13 for 150 g – remember, my biscotti are trans fat free and dairy free (hurrah!). Looking for a different flavour profile for your jamuan this Hari Raya? I’m happy to share with you a toothsome cookie combo for this blessed Eid ! Delight your guests with The Midnight Baker Malaysia’s delicious soft baked, egg-free Coconut Oat cookies. Think of it as coconut candy – but in a cookie ! Also back by popular demand, the trans fat-free & sugar reduced Cranberry Flaxseed Oat cookies are a sure hit among the young and young-at-heart. Bring home this cookie combo; be it for balik kampung or buah tangan… or for yourself ! Present your friends and family with any two tubs of the Cookie Combo as buah tangan, in our environmentally-friendly recyclable carrier bag. Click on the Order button now ! 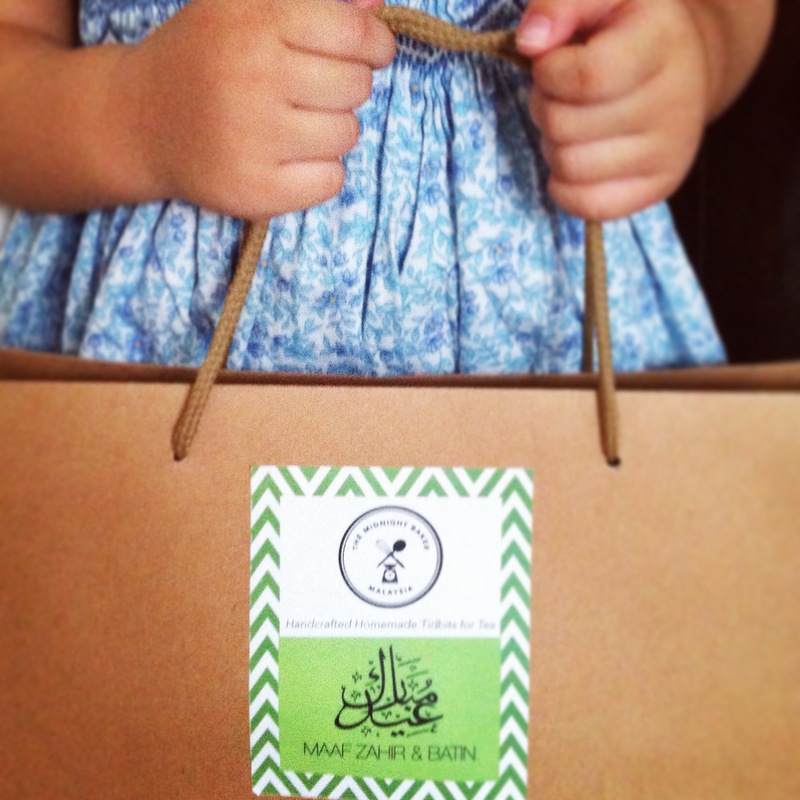 Orders are open now till 15 July 2014. Don’t you love delving into the historical origins of food! The delicious ANZAC biscuits were first made during World War 1 for the Australian and New Zealand Army Corps, hence its name. 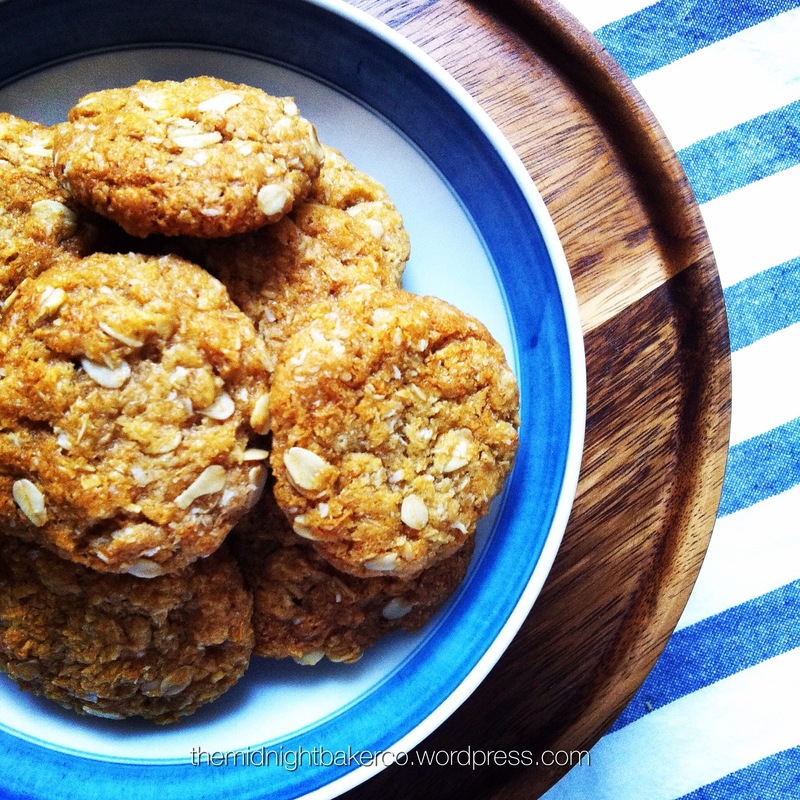 The three main stars in ANZAC biscuits are desiccated coconut, rolled oats and golden syrup. Replicating the flavour profile, I’ve made these into soft-baked coconut oat cookies, which are available on the menu now. These egg-free cookies are delicious paired with a good hot cup of coffee (or tea, if you prefer!). If, like me, you wax lyrical over a childhood favourite called Candy Kelapa (Coconut Candy), then this is the cookie for you. If you are looking for a healthier teatime treat to bring home for the powerhouse behind the#worldstoughestjob, do try The Midnight Baker Malaysia’s special bakebox. Made from love, with love. You don’t have to wait once a year to fete her. 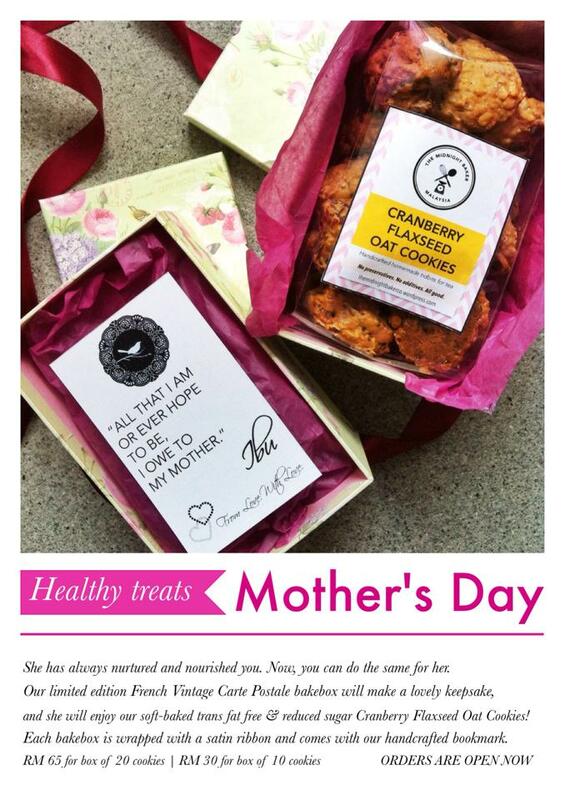 Because everyday should be Mother’s Day. Crammed with cranberries, full of flaxseed and robust rolled oats, 10 of these delicious cookies weigh ± 200 g. Trans fat free & kurang gula (reduced sugar), get them today! Hands down, this delicious chocolate brownie scores high marks for its healthy factor – it is a vegan and gluten-free brownie! 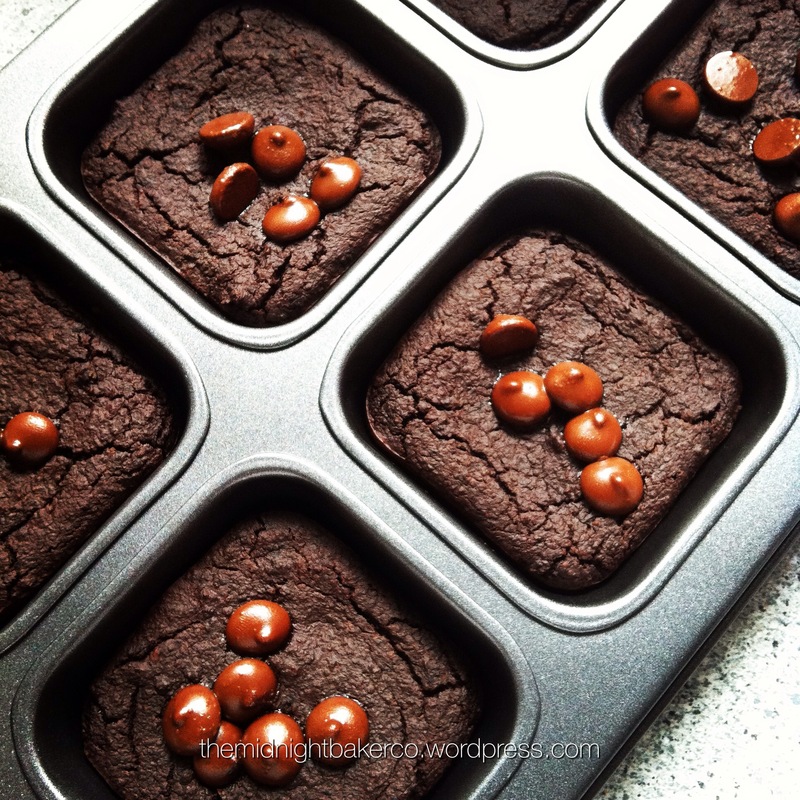 When you bite into it, you wouldn’t believe that it has NO flour and NO eggs; yet remains moist, chewy and very much like old-fashioned brownies. The secret lies in the black beans and coconut oil combo that I use. You could get these square bites topped with Belgian dark chocolate chips, or almond nibs. What are you waiting for? NO PRESERVATIVES. NO ADDITIVES. ALL GOOD. CNY 2015 Cookie Combo. It’s good to be different. Dark chocolate melted into the butter cake ups the ante from the traditional cocoa powder. Aidil Fitri 2014. It’s good to be different. Faces of some of my fitfam, enjoying the#SukaSukaSukaneka organised by Coach (Zin) @azyismail of @fitnesssquadkl on Sunday, 21 April 2019! Was the videographer/photographer for the event. Hundreds of photos to sieve through, with one common denomination: #HappyShinyPeople ❤️! . . #SayaAJK #TheNightmareSquad #SmellsLikeTeamSpirit . . More posts to come, my lovelies. Watch this space! Copyright © 2013 - 2017 The Midnight Baker. All rights reserved. The copyright to all content, images and photographs on this blog belongs to themidnightbakermalaysia .com and to me, the blog owner (Natasha Yusop) as author of the content. Do not copy and do not plagiarize any images, photos or content of this site. "The Midnight Baker" (Business Registration No. 002288837-D) is legally registered with the Companies Commission of Malaysia (Suruhanjaya Syarikat Malaysia). Our premise is registered with the Food Safety & Quality Division, Ministry of Health Malaysia. "The Midnight Baker" (Business Registration No. 002288837-D) is legally registered with the Companies Commission of Malaysia (Suruhanjaya Syarikat Malaysia). Our premise is registered with the Food Safety & Quality Division, Ministry of Health Malaysia.